Dr. Melinda Whitaker’s father encouraged and inspired her to become a veterinarian. While growing up in Moyock, North Carolina, she was surrounded by barn cats, hunting dogs and horses. “I always had puppies and kittens to play with as a child,” she remembers. Dr. Whitaker earned a bachelor’s degree in journalism from the University of North Carolina at Chapel Hill and studied animal science at North Carolina State University. She received her Doctorate of Veterinary Medicine from North Carolina State University College of Veterinary Medicine in 1997. Dr. Whitaker enjoys the daily variety of being a veterinarian. “I get to see different people and cases – every day is not the same,” she says. She stays up-to-date on the latest veterinary advances through attending regular continuing education meetings and through her memberships in the North Carolina Veterinary Medical Association and the American Veterinary Medical Association. 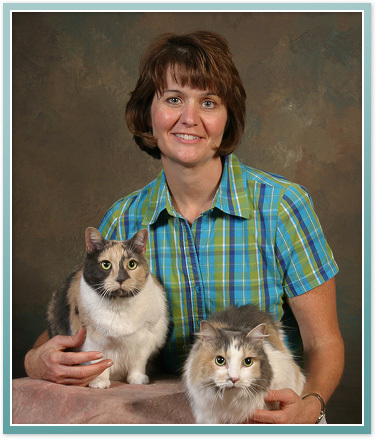 At home, Dr. Whitaker and her husband, Doug, take care of their two active children as well as four cats, Polka Dots, Boo, Storm and Big Mac. She is actively involved in her church as a Sunday school teacher and an elder. She serves on the board of the Olympic High School Marching Band Boosters as well as volunteering with her Eagle Scout’s Boy Scout Troop.